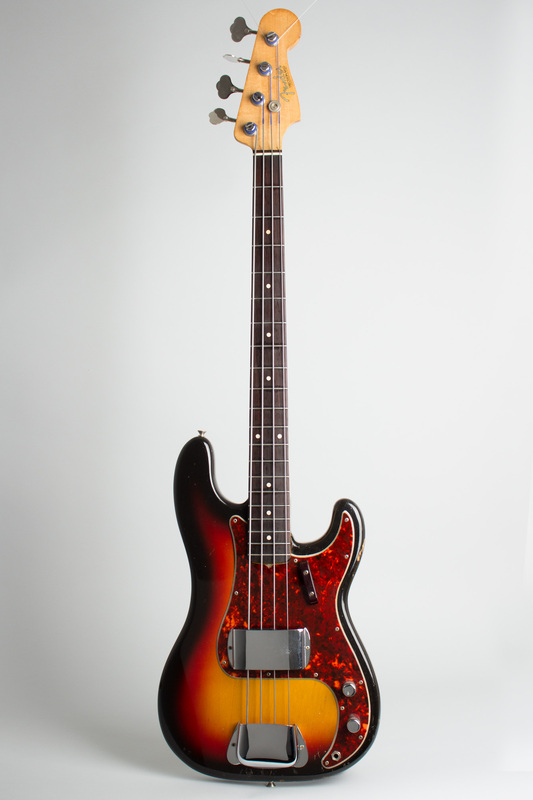 Fender Precision Bass Model Solid Body Electric Bass Guitar (1963), made in Fullerton, California, serial # 92338, sunburst lacquer finish, alder body, maple neck with rosewood fingerboard, period black tolex hard shell case. 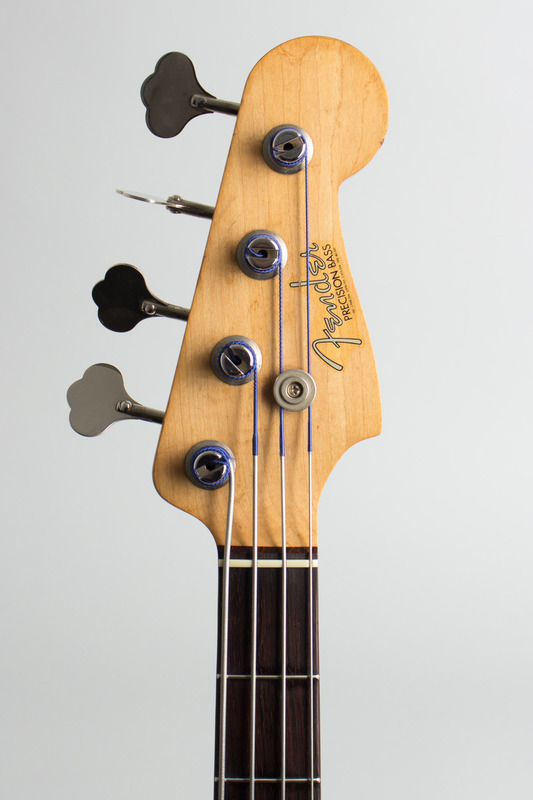 This is a lovely solidly pre-CBS Precision Bass, with the look, feel, and sound that defines the classic '60's Fender bass. 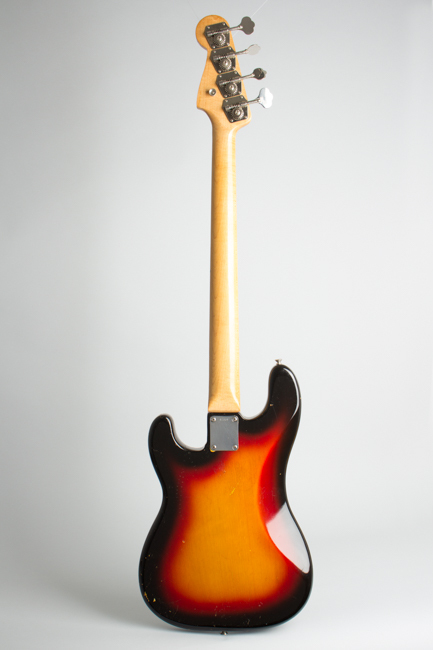 The features of this particular period include a thin rosewood fingerboard with clay dot inlay, "Spaghetti" silver Fender logo decal, tortoiseshell pattern thick nitrocellulose pickguard and a blended sunburst finish a bit mellower than the "target" sunburst of the later 1960's. 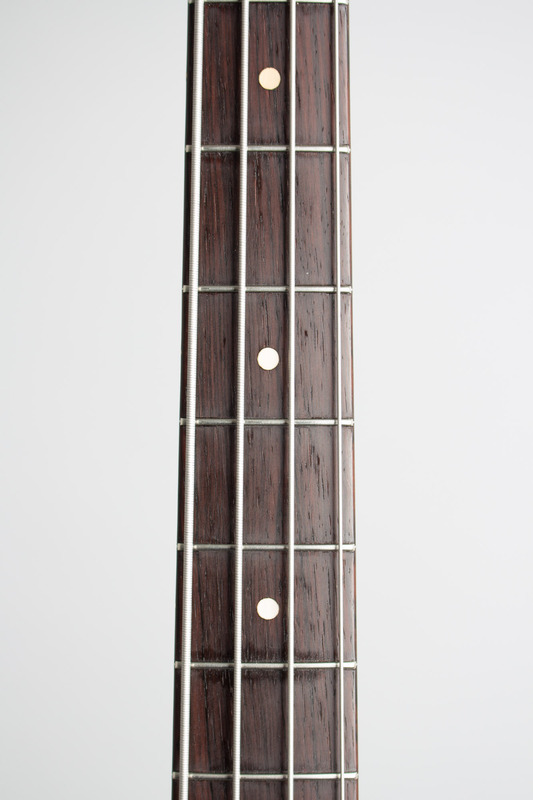 The neck and body are finished in the thinner Pre-CBS style lacquer. The neck heel is stamped 5 JAN 63 C, rather poorly inked but legible on close inspection. 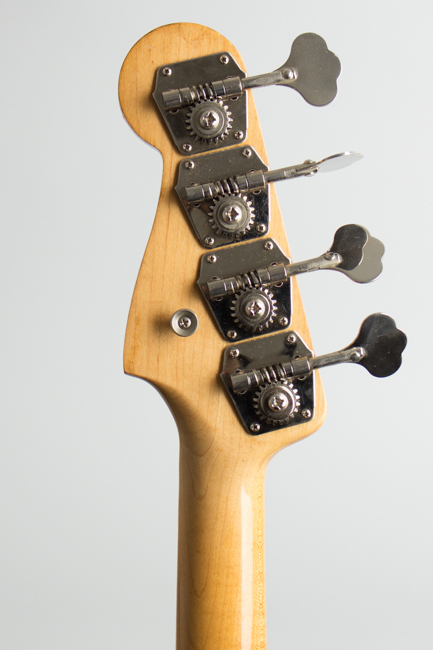 The bass was likely assembled in early 1963 -the pots are older coded 62-12 but that is common with Fender instruments of the time. It has seen some moderate use over 50+ years but remains far better preserved than many from this period. It has the classic sound with a bright midrange bark that warms up nicely when the tone knob is rolled off a bit. 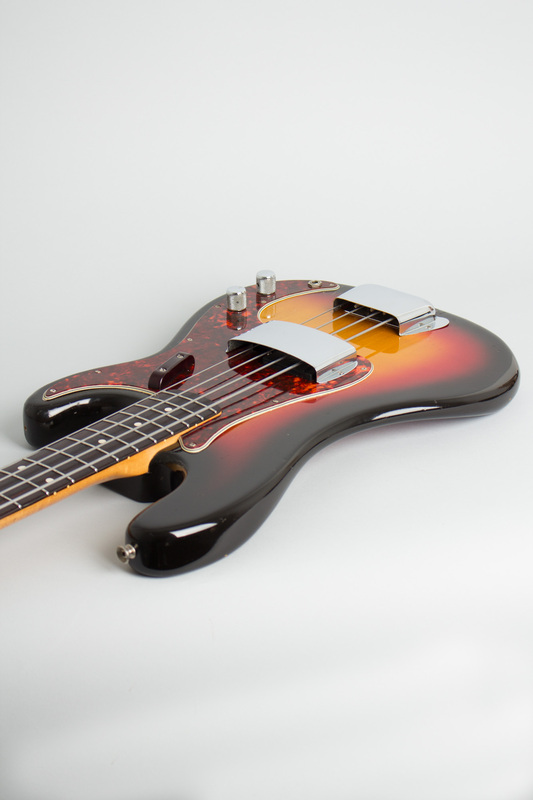 This is a great example of the world's standard electric bass, still ruler of the roost 50+ years on and ready for the next half-century of low end action. 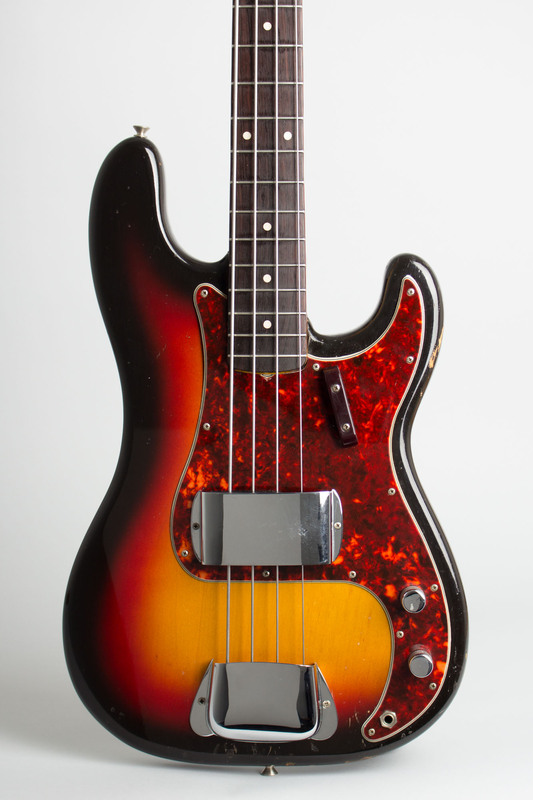 This era Precision Bass is an absolute classic, played by the great majority of the electric bassists of the 1960s and heard on literally thousands of recordings since then. It remains a wonderful instrument for any style of music, an absolute joy to play, and a prime example of the glory days of Fender. Overall length is 45 3/4 in. (116.2 cm. ), 13 in. (33 cm.) wide at lower bout, and 1 5/8 in. (4.1 cm.) in depth, measured at side of rim. Scale length is 34 in. (864 mm.). Width of nut is 1 3/4 in. (44 mm.). This bass remains in very fine condition with all original hardware and finish. It has typical light wear with dings and chips to the finish-mostly to the edges-but no large areas of loss to the lacquer. There is a small spot of curly-cord burn to the back and a couple of random screw holes in the lower body horn where it looks like someone attached strap buttons for left handed use at some point. The neck has just been trued and refretted with period style wire and plays excellent. A superb example, not the lightest at 8 LB 13 Oz. but still perfectly balanced and one of the nicest we have had in a long time. 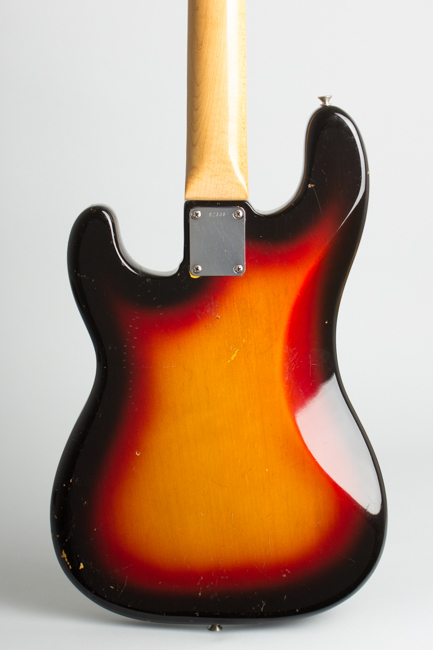 It is currently housed in a clean later 1960's "tail logo" Fender case. Excellent Condition.